On 5 September 2016, Knorr-Bremse AG ("Knorr-Bremse") announced a public offer to the shareholders of Haldex AB (publ) ("Haldex") to tender all shares in Haldex to Knorr-Bremse (the "Offer"). The offer document regarding the Offer was made public on 26 September 2016. The acceptance period in the Offer lapses on 16 June 2017. Knorr-Bremse AG announced today that it has filed a request with the Swedish Securities Council (SSC) to be granted an exemption from the maximum total acceptance period. The reason for the application is that Knorr-Bremse has made the assessment that the possibilities to obtain merger clearance on terms acceptable to Knorr-Bremse will be significantly enhanced should Knorr-Bremse have additional time to provide more thorough and detailed information to the authorities and prepare potential remedies. Knorr-Bremse could thus optimize the official EU filing and ensure that the best course of action is chosen. 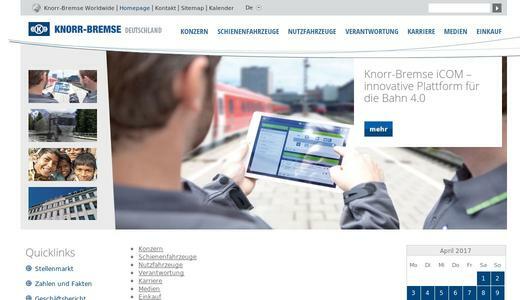 Knorr-Bremse also wants to have additional time to demonstrate how the planned transaction will improve the innovation capacity and provide benefits for customers. Knorr-Bremse has requested permission to extend the maximum acceptance period to 26 September 2017. Knorr-Bremse believes that the period requested is sufficient for the offer process to be completed. In addition, Knorr-Bremse has asked that the SSC allows the closing of the acceptance period earlier than that date should all relevant regulatory approvals be obtained earlier. The decision by the SSC can be expected at the earliest on 25 April 2017. "The requested extension has been made to optimize the possibilities for the merger clearance on terms beneficial to the combination of Knorr-Bremse and Haldex. Our objective is unchanged. We want to create one of the leading truck and trailer systems providers and deliver solutions for autonomous driving that are greatly valued by customers. Based on an open and trustful dialog with the anti-trust authorities and Haldex we remain committed to the successful closing of the Haldex offer in the best interest of both companies and its stakeholders," commented Klaus Deller, Chairman of the Executive Board of Knorr-Bremse AG. For other terms and information about the Offer please refer to the offer document. This announcement is not an offer, whether directly or indirectly, in Australia, Canada, Hong Kong, Japan, New Zealand or South Africa or in any other jurisdictions where such offer pursuant to legislation and regulations in such relevant jurisdictions would be prohibited by applicable law. Shareholders not resident in Sweden who wish to accept the Offer (as defined below) must make inquiries concerning applicable legislation and possible tax consequences. Shareholders should refer to the offer restrictions included in the section titled "Important notice" at the end of this announcement and in the tender offer document which was published on 26 September 2016. Shareholders in the United States should also refer to the section titled "Special notice to shareholders in the United States" at the end of this announcement.